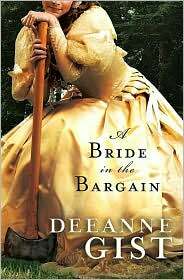 Since I can't go without reading something, I looked through my Kindle and found a book that I read last year when it released and remember enjoying quite a bit - A Bride in the Bargain by Deeanne Gist - and decided to re-read it, slowly as the opportunity arose. I didn't write a review for this book the first time I read it, although I did include a few quick impressions with my Weekly Reads post at Musings. Because my time is so restricted at the moment and I'm not sure how things are going to work out, this review will serve as an early posting for both my 2010 Re-Read Challenge and my 2010 Year of the Historical Challenge for the month of December. A Bride in the Bargain by Deeanne Gist is an inspirational historical romance set in the Washington Territory during the Civil War. I don't usually read inspirational books, this was a first and still the only book in the sub-genre I've read. However, this book initially caught my attention because of the setting and the plot, and both turned out to be excellent. I love Seattle, Washington. It's one of my favorite places and this story is set during the 1860's and highlights that area's history as Ms. Gist uses historical facts to weave this romance. In fact, quite a few of the characters in the book are based on personages who existed during those times and all the newspaper clippings featured in the book are taken from archives. The story itself is based on truth and one shared by many men and women. Joe Denton needs a bride to keep his land. Ana Ivey is a nineteen year-old orphan from Granby, Massachusetts who lost her whole family during the Civil War. Destitute and desperate, she becomes one of the Mercer girls along with 299 other war widows or orphans. These women go west to marry or work after signing contracts with Mr. Mercer. On the other side of the country, the men also sign contracts and pay for brides or employees. In this case, Joe thinks he paid $300.00 for a bride. Ana thinks she paid $50.00 to work as a cook to Joe and his crew of lumberjacks. They are both deceived by Mr. Mercer. This story shines when it comes to historical details and the beauty with which Ms. Gist describes the setting and circumstances. The romance itself is warm and there are many conflicts placed in the couple's path to resolve before the "happily ever after" is finally reached. Joe and Ana are a nice couple and I really enjoyed most of their interactions and the way they slowly fall in love. Joe is portrayed as a good man who loves his land above all else. The land is satisfying enough, but he's lonely and obviously needs Ana in his life. Ana is a young woman, 19 years old, who after losing her whole family during the Civil War, is full of guilt and regret. She is what I think of as a plucky girl who won't back down, but has growing up to do. As I mentioned above this is my one and only inspirational read. I was pleasantly surprised in that A Bride in the Bargain wasn't overly preachy throughout, instead the "inspirational" side of the story was more of a subtle message. The story wasn't perfect, however, and there were a few frustrating moments for me. The first time I read the book, I grew a bit impatient towards the last quarter of the book with Ana's character and her lack of maturity. This time around, that section didn't seem to bother me as much as it did the first time -- Ana's circumstances were quite dire and the guilt and regret she felt, made her actions understandable. However towards the end, there just seemed to be one too many dramatic obstacles thrown in the couple's path to deliver the message, and that did seem contrived and unnecessary. In my opinion by that time, the readers (and characters) had already received it. Overall, A Bride in the Bargain is a book I would recommend to all romance readers as an great historical romance read - especially for those readers who love Americana and excellent historical details with their romance. This is a beautifully written book and if you're a reader who loves inspirational books, you will definitely love this book. I liked it the first time I read it, but I found that this story was more enjoyable for me the second time around. Wonderful review Hils - I have this one and a couple other Gist books on the tbr pile because of Wendy's reviews. And I love the Pacific NW setting. Thanks for this review, can you believe the coincidence, I also have one book by this author, also the first in the genre I'll try. Great review for this book. I have to admit though, I'm not sure if it's for me, not such a fan of Americana genre. If you love Pacific NW historical setting, then you'll really like this book. I really enjoy that aspect of this book. :) I'm also planning on reading other books by Gist. Ohhh, you're going to read A Bride Most Begrudging! I can't to read your thoughts on that book. I'm hoping to read in the near future also. It's an interesting genre and I'm glad I gave it a try. Hugs! Nath, things are finally settling down and all is well. Thank you!